I’m deciding if I should start counting calories again. I’ve been on a calorie counting hiatus for about 2 weeks and it’s been going well but I feel like maybe I need that push to lose those 10 lbs. I don’t like restricting myself, I try not to do that but sometimes maybe we just need a push? I don’t know. It’s also pretty hard to keep track of calories when I started baking and cooking for myself. Figuring out calories for that is killer. 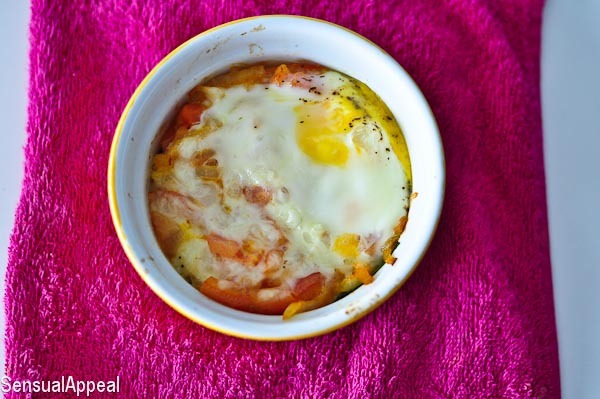 Well, for breakfast today I made a different baked egg, one that I actually liked better than my Baked Muffin Egg. Probably because there was no grains in this one. Both taste good but sometimes (okay, usually) I try to keep my carb intake to one to two servings per day. Unless it’s a cheat day. Or if I’m baking.. then it’s a whole different story haha. Whatever, live your life people! 🙂 This is a great breakfast because it’s fast and easy. I prepared everything I needed and popped it in the oven for 20 minutes during which I managed to shower and get dressed after working out. By the time the egg was ready – I was ready, well kinda. But yeah, it’s pretty awesome. Preheat oven to 350 degrees F. Coat your large ramekin with cooking spray. 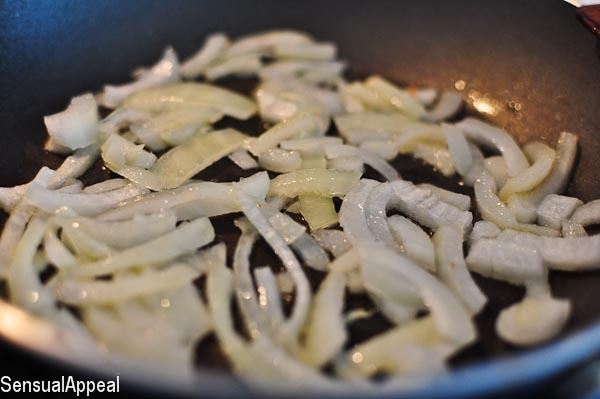 Put some olive oil on a pan and set on medium heat. Throw in chopped onions and cook for about 2 minutes. 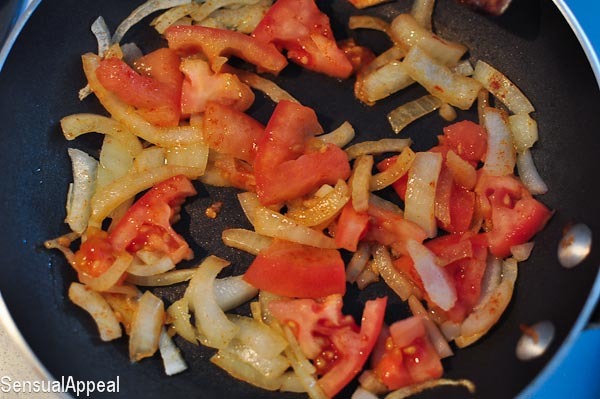 Once the onions have become a little translucent, throw in chopped tomatoes. Sprinkle the onions & tomatoes with ceyenne pepper. Cook for another 2 minutes or so until onions are translucent and tomatoes look cooked through. 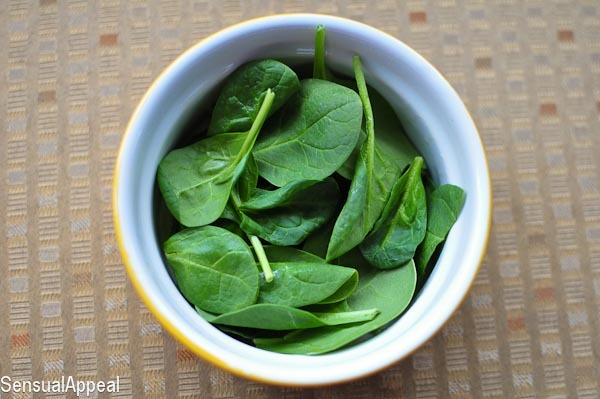 Layer the bottom of the coated ramekin with a handful of fresh spinach. 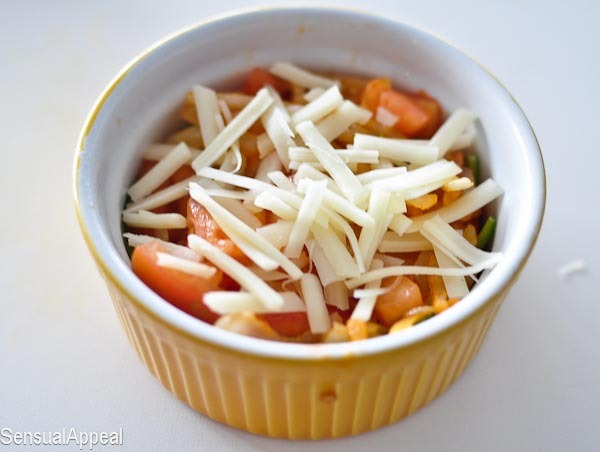 Put your cooked onions & tomatoes on top of the spinach and top with mozzarella cheese. 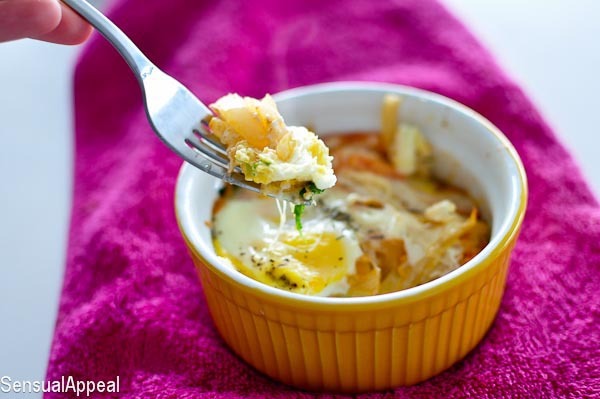 Crack an egg into the ramekin and let the yolk spread a little bit. Sprinkle a bit of salt & pepper. 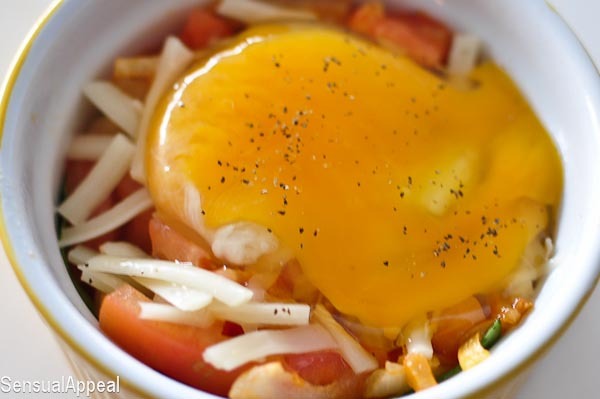 Do you prefer baked or fried eggs? What’s your favorite veggie to eat with eggs? 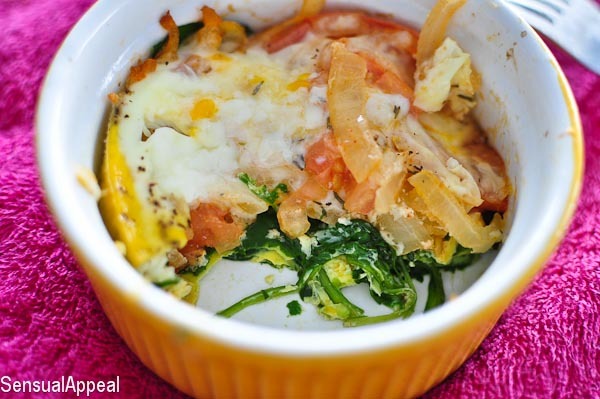 In my opinion life’s too short to be counting calories… anyway… this looks really awesome – I adore spinach baked with eggs. 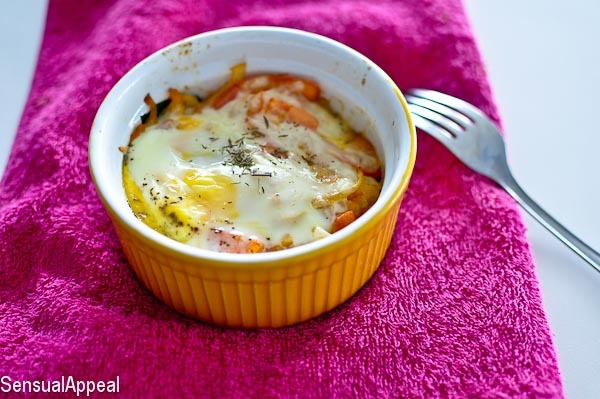 I love baked eggs and anything with veggies is a plus in my book 🙂 or any kind of eggs for that matter – a delicious and filling way to start your day!